I posted here about my intermittent problem with missing pupil data. Just to refresh -- I am using PsychoPy to record and save pupillometry data as IDF files during various speech-in-noise tasks, and then using the IDF converter to convert the IDF files into text files. We have had several random instances of the IDF files missing all the “Mapped pupil diameter (mm)” values. The idf converter has greyed out the option of selecting particular data sets with the problem. The cause of the problem seems to be due to a problem with measuring of some of the other parameters (I have attached an image of these parameters - export raw data and export points of regard), thus, the eye tracker cannot use this data to convert to the mapped pupil diameter data (mm). 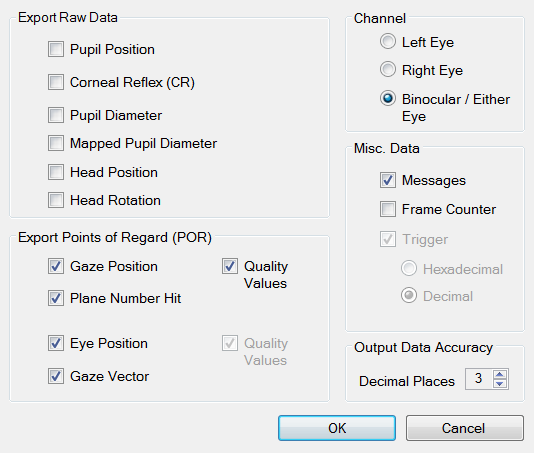 In cases of missing “mapped pupil diameter” the selected parameters (in the image) don’t have any data but in cases with no missing data, the values are there. Unfortunately, there is currently no way for us to tell this is happening until we use the IDF converter and try to get the data (only to find that “mapped pupil diameter” is greyed out) and by that time, a whole condition needs to be thrown out. My main question is – is there a way to cause my PsychoPy program to alert me (either by printing a message or crashing the program) when some particular data is not recorded properly in a given condition? Any help is greatly appreciated and I am very happy to provide more details of the study/problem if need be.